Everyone has reasons to celebrate whether it's a wedding, a christening, an anniversary, or one of those special birthdays. The Whalebone also caters for corporate meetings in the private barn too. 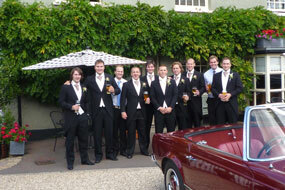 The Whalebone provides a unique venue - and one that has received a wealth of accolades from others who have held their special events in the Barn or marquees behind the pub. The Barn seats up to 50 and can extend into the pavilions - all with heating and lighting - to really make your party perfect. Call now on 01206 729307 to book your date and discuss your event. "Tilly's party was fantastic. The food and venue were perfect, all our guests were very impressed."